RUN LIGHTER ALONG UNLIT CIGARETTE TO ROAST THE TOBACCO. RUB together (or "mull", as they say in Goa) dried tobacco and herbal substance in palm of hand. Place stone in chillum and pack in the mixture, remembering to observe the solemnity of the occasion. Place Muzik's "Fluoro" mix tape in your system and press play. Attach a damp piece of cloth (a "Sufi") around the end. Light chillum (matches only), raise to the forehead saying, "Boom shanka" and inhale deeply. Pass to your left before keeling over. Of course, Muzik would never encourage anyone to sample illegal substances, but we do plead guilty to bringing you some top trance tunes. For your listening pleasure, we've joined forces with Paul Oakenfold and selected five choice tracks from his "Perfecto Fluoro" double CD, a project which looks set to take trance to a dramatically higher level. 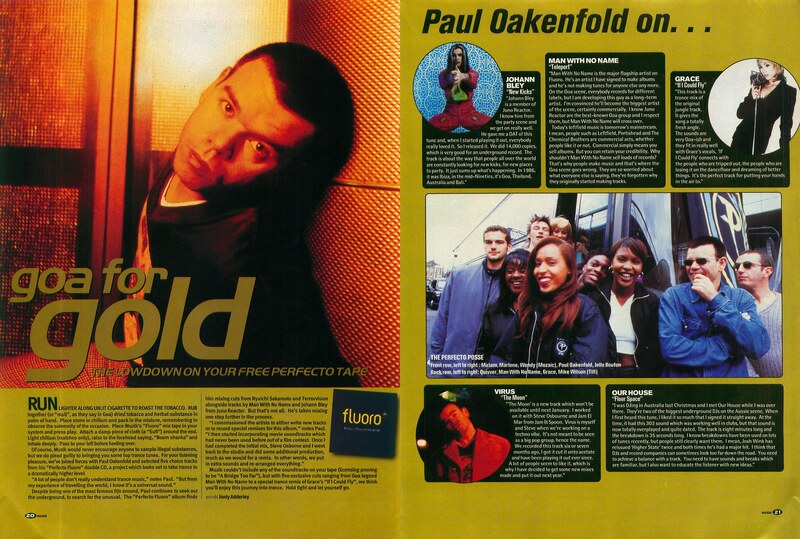 "A lot of people don't really understand trance music," notes Paul. "But from my experience of travelling the world, I know it's a universal sound." Despite being one of the most famous DJs around, Paul continues to seek out the underground, to search for the unusual. The "Perfecto Fluoro" album finds him mixing cuts from Ryuichi Sakamoto and Terrorvision alongside tracks by Man With No Name and Johann Bley from Juno Reactor. But that's not all. He's taken mixing one step further in the process. "I commissioned the artists to either write new tracks or to record special remixes for this album," notes Paul. "I then started incorporating movie soundtracks which had never been used before out of a film context. Once I had completed the initial mix, Steve Osborne and I went back to the studio and did some additional production, much as we would for a remix. In other words, we put in extra sounds and re-arranged everything." Muzik couldn't include any of the soundtracks on your tape (licensing proving to be "A Bridge Too Far"), but with five exclusive cuts ranging from Goa legend Man With No Name to a special trance remix of Grace's "If I Could Fly", we think you'll enjoy this journey into trance. Hold tight and let yourself go. "Johann Bley is a member of Juno Reactor. I know him from the party scene and we get on really well. He gave me a DAT of this tune and, when I started playing it out, everybody really loved it. So I released it. We did 14,000 copies, which is very good for an underground record. The track is about the way that people all over the world are constantly looking for new kicks, for new places to party. It just sums up what's happening. In 1986, it was Ibiza, in the mid-Nineties, it's Goa, Thailand, Australia and Bali." "Man With No Name is the major flagship artist on Fluoro. He's an artist I have signed to make albums and he's not making tunes for anyone else any more. On the Goa scene, everybody records for different labels, but I am developing this guy as a long-term artist. I'm convinced he'll become the biggest artist of the scene, certainly commercially. I know Juno Reactor are the best-known Goa group and I respect them, but Man With No Name will cross over. Today's leftfield music is tomorrow's mainstream. I mean, people such as Leftfield, Portishead and The Chemical Brothers are commercial acts, whether people like it or not. Commercial simply means you sell albums. But you can retain your credibility. Why shouldn't Man With No Name sell loads of records? That's why people make music and that's where the Goa scene goes wrong. They are so worried about what everyone else is saying, they've forgotten why they originally started making tracks. "This track is a trance mix of the original jungle track. It gives the song a totally fresh angle. The sounds are very Goa-ish and they fit in really well with Grace's vocals. 'If I Could Fly' connects with the people who are tripped out, the people who are losing it on the dancefloor and dreaming of better things. It's the perfect track for putting your hands in the air to." "'The Moon' is a new track which won't be available until next January. I worked on it with Steve Osbourne and Jam El Mar from Jam & Spoon. Virus is myself and Steve when we're working on a techno vibe. It's not meant to be seen as a big pop group, hence the name. We recorded this track six or seven months ago, I got it cut it onto acetate and have been playing it out ever since. A lot of people seem to like it, which is why I have decided to get some new mixes made and put it out next year." "I was DJing in Australia last Christmas and I met Our House while I was over there. They're two of the biggest underground DJs on the Aussie scene. When I first heard this tune, I liked it so much that I signed it straight away. At the time, it had this 303 sound which was working well in clubs, but that sound is now totally overplayed and quite dated. The track is eight minutes long and the breakdown is 35 seconds long. I know breakdowns have been used on lots of tunes recently, but people still clearly want them. I mean, Josh Wink has reissued 'Higher State' twice and both times he's had a major hit. I think that DJs and record companies can sometimes look too far down the road. You need to achieve a balance with a track. You need to have sounds and breaks which are familiar, but I also want to educate the listener with new ideas."